On this day in 164 BC, Judas Maccabaeus, son of Mattathias of the Hasmonean family, restores the Temple in Jerusalem. This event is commemorated each year by the festival of Hanukkah. On this day in 1877, Thomas Edison announces his invention of the phonograph, a machine that can record and play sound. On this day in 1905, Albert Einstein's paper “Does the Inertia of a Body Depend Upon Its Energy Content?” is published in the journal "Annalen der Physik". This paper reveals the relationship between energy and mass. This leads to the mass–energy equivalence formula E = mc². On this day in 1927, striking coal miners in Columbine, Colorado, are attacked with machine guns by a detachment of state police dressed in civilian clothes in what some people refer to as the FIRST Columbine Massacre. On this day in 1953, the world famous Piltdown Man fossil, which had allegedly been discovered in 1912, is exposed as a hoax. Naturally, a whole lot of stupid people took this to mean that evolution was a fraud, that science was suspect, that dinosaur bones were put on the Earth by God to test our faith, and that every time a bell rings, an angel gets it's wings. Now go to bed and shut yer cakehole, Captain Curious! On this day in 1963, a number of known assassins associated with the Mafia, Cuban exiles and Intelligence agencies stayed at a Dallas motel and other sites in and around the city. Meanwhile, across town at the home of Dallas millionaire Clint Murchison, vice-President LBJ, future President Richard Nixon and Jack Ruby's close friend H.L. Hunt all attend a party together. The guest of honor was the cross-dressing, Martin Luther King-hating head of the FBI: J. Edgar Hoover. On this day in 1969, the first permanent ARPANET link is established between UCLA and SRI. On this day in 1973, a gap of 18-1/2 minutes is revealed in one of the Watergate tapes. Nixon's lawyers' claims that the gap wasn't important because it consisted mostly of "a really boring drum solo" didn't fly with prosecutors. On this day in 1974, the Birmingham Pub Bombings kill 21 people. The Birmingham Six are sentenced to life in prison for the crime but subsequently acquitted. 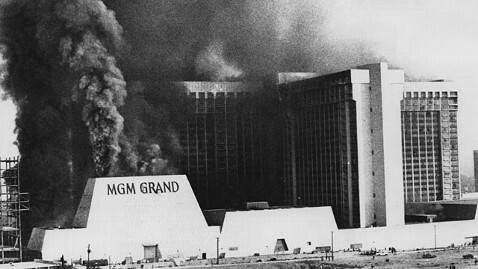 On this day in 1980, a deadly fire breaks out at the MGM Grand Hotel in Paradise, Nevada (now Bally's Las Vegas). 87 people are killed and more than 650 are injured in the worst disaster in Nevada history. On this day in 1985, US Navy intelligence analyst Jonathan Pollard is arrested for spying after being caught giving Israel classified information on Arab nations. He is subsequently sentenced to life in prison. On this day in 1986, National Security Council member Oliver North and his secretary Fawn Hall start to shred documents allegedly implicating them in the sale of weapons to Iran and channeling the proceeds to help fund the Contra rebels in Nicaragua. Just one more sordid chapter in the Iran-Contra Affair.